A graduation is a grand ceremony meant to celebrate an individual’s academic achievements. It’s the time when all those sleepless nights and random breakdowns become all worth it. Students, faculty members, and parents are acknowledged for their never ending support and constant effort. It can also be the most memorable yet sentimental day of a person’s life. Oftentimes, there are individuals who are invited to deliver a speech template to the audience. 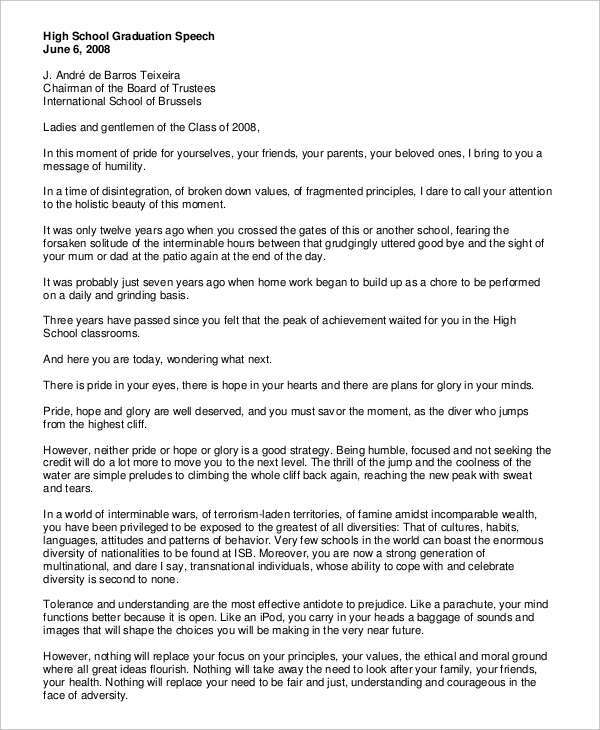 This is called a graduation speech. What Is a Graduation Speech? 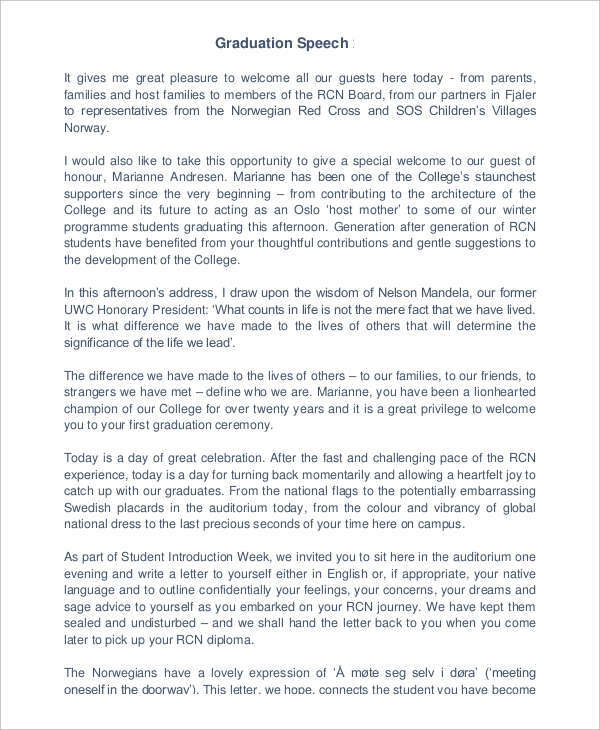 A graduation speech, also known as a commencement address, is a type of speech that is addressed to graduating students during their commencement rites. 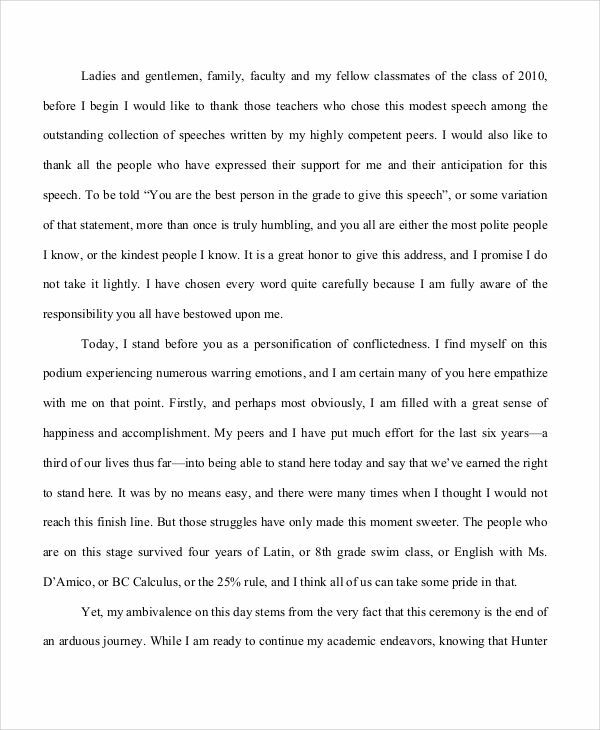 The speech template is typically given by faculty members or overachievers. It is meant to inspire and motivate an audience. 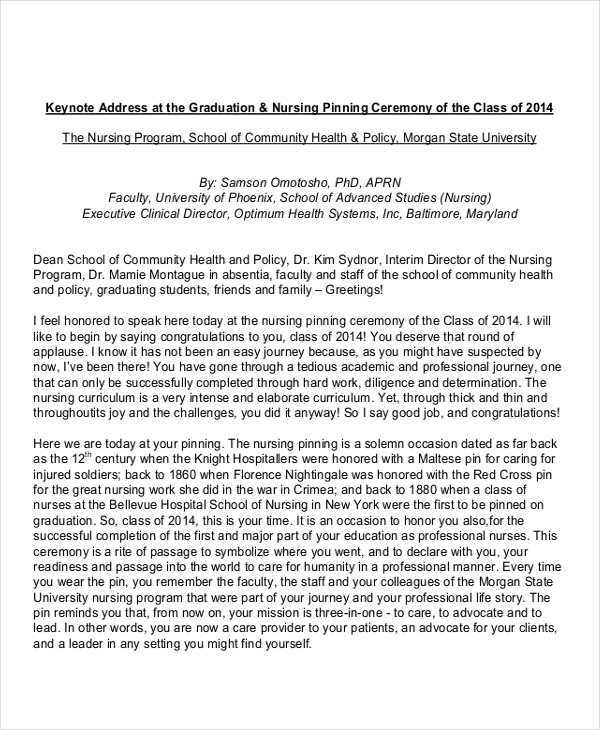 To make it extra special, a graduation speech should be made beautifully for it to be worth remembering. 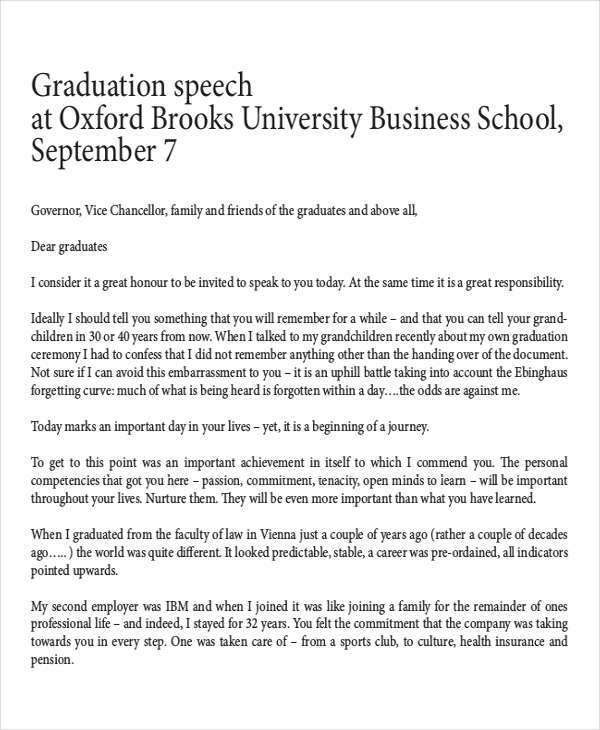 There are speech example in pdf that contain speeches similar to a graduation speech. 1. Think about what you want to talk about. This refers to the overall message of your speech. 2. Tell a story. This could be an inspirational story of a respective individual or your own personal hardships. 3. Inspire. A graduation speech is also a motivational speech. It allows listeners to feel proud of themselves. 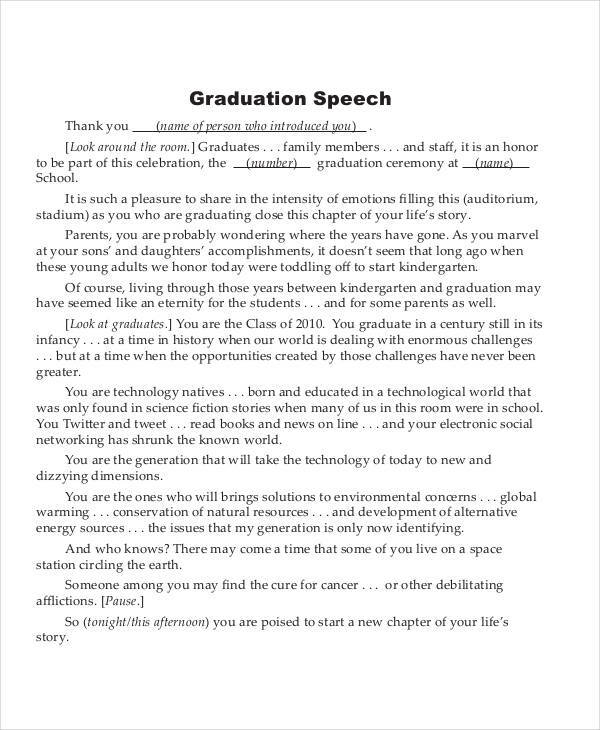 Why Do We Need a Graduation Speech Example? Sometimes, the process of making the perfect speech outline involves long nights and a lot of crumpled papers. We’re either experiencing major writer’s block or we’re just absolutely clueless on what to talk about. Regardless, writing a good speech is not an easy job. 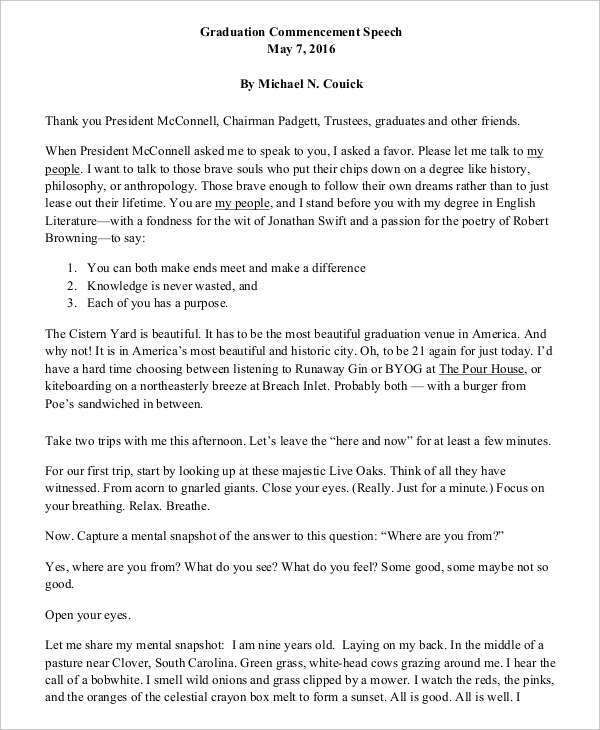 How do I start my speech? Is this appropriate to say at a graduation? These are the questions that we’re stuck with when writing a graduation speech. Sometimes, we just need a little guidance to get started. This is when references serve their purpose. 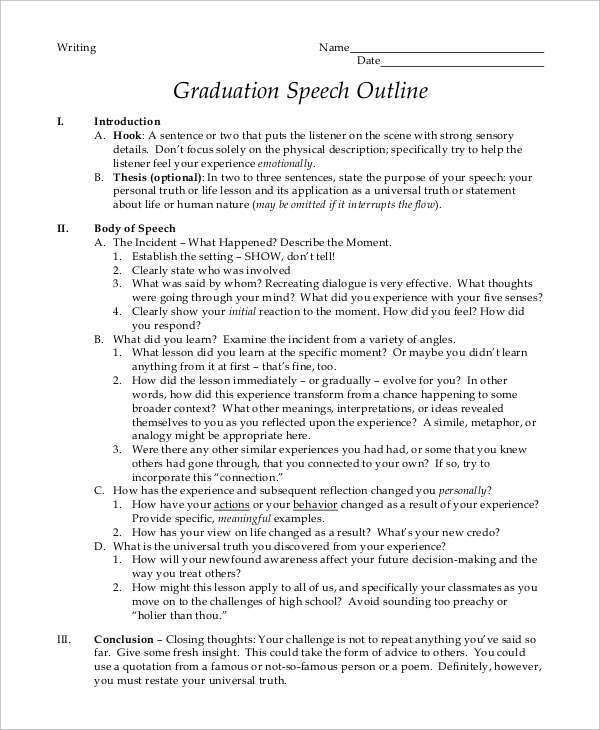 Graduation speech templates and examples help us put together our thoughts. We gather ideas from these examples and we feel knowledgeable enough to make our own. Graduation speech examples are everywhere. Downloadable speech examples in Word format are typically made available for you to use. You can search on inspirational speech examples and watch these speeches be delivered as well. This would give you an idea on how to write and deliver your own. Furthermore, an actual output is often more useful than mere guidelines. This is because examples provide us with the end product of these steps. With the right examples, we’re able to identify the right flow and structure of a speech.